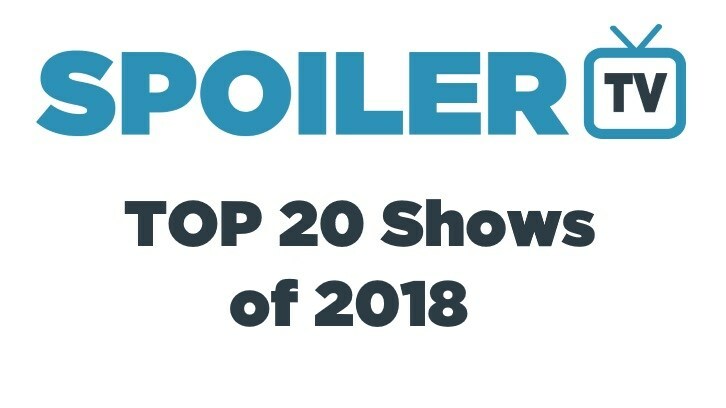 As we approach the final days of 2018, end of year TV lists become all the rage, particularly the list of best shows from the past 12 months. Here at SpoilerTV, we have just over 70 team members, so rather than asking just one or two people to submit opinions, we compile a collective list from whomever among the team wishes to air their thoughts. 53 of our team submitted their top ten shows of the year, and below is the combined top 20. From a combined 315 shows, 159 unique shows were chosen somewhere in a top ten list by at least one team member, giving a real diversity to our list. Without further ado, here's our top 20. We had a tie on the scoring between The Haunting of Hill House and Killing Eve — two shows which debuted this year — but on the tiebreaker of shows picked as number one, Netflix's Hill House takes the crown this year. The Americans — which ended this year in stark contrast to the two shows above it — Sharp Objects and 12 Monkeys make up the top five. Syfy's time-travel drama also ended this year and few would likely have predicted it would have placed so highly here. Commonly touted shows among critics like Better Call Saul (21st), Atlanta (33rd), Pose (41st), Barry (77th), and Succession (88th) don't make the top ten. For those interested, here is the full table. You can also see 2017's results here - the two lists share nine shows. In the next couple of days, we'll open up our annual poll allowing you, the reader, to make your picks for the best shows of the year. For now, though, feel free to share your lists in the comments below.